If you're still wondering what kind of meat you want to prepare for Easter and if you only have a few people to serve this is the perfect ham dish. It's easy, pretty and delicious. If you have more people to serve, buy more ham steaks and make extra sauce. 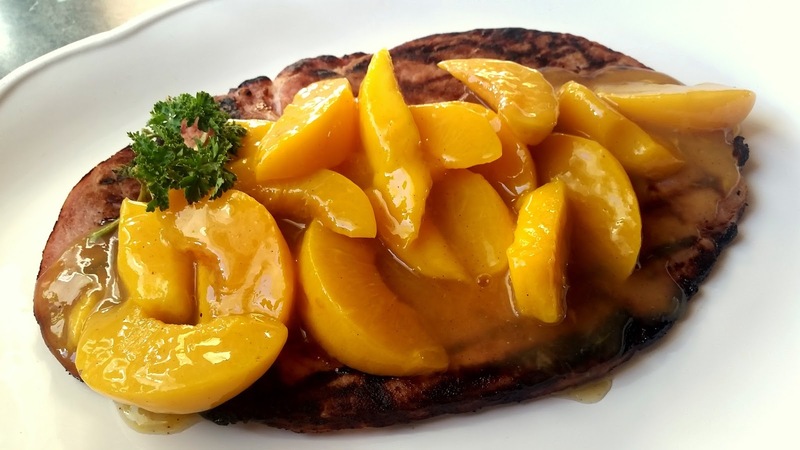 This peach mango sauce can also be used over ice cream or in a crisp. So many possibilities. Recipe adapted from an old Country Woman magazine. 1 ham steak, 1 1/2 pounds, fully cooked. It doesn't really matter if it's a little over or under that weight. The one I purchased was approx 1/2" thick. 1 can of sliced peaches (473 ml / 16 oz), drained. Reserve 1/2 cup syrup. 1 mango, peeled and cut into strips. I used a medium sized mango but it doesn't really matter. Grill ham steak just long enough to heat through and to give it nice grill marks. Cover and keep warm while preparing peach mango sauce. In a medium size bowl (microwave safe) whisk together sugar, cornstarch, cinnamon, nutmeg, lemon juice, orange juice, and reserved peach syrup. Cook until thickened and smooth, approximately 4 minutes, whisking frequently to prevent lumps. Stir in peach and mango slices. Pile on top of your ham steak, making sure you get some of the sauce as well. If you have extra, serve at the table for those who would like more fruit. Betty - this is making my mouth water. What a nice way to serve ham steaks!